Can’t decide between pie and cake this Thanksgiving? We have just the solution for you. Introducing the piecaken, the ingenious idea of baking an entire pie (or two) inside a cake. As Americans, we love stuffing things inside other things. Then stuffing said things in their mouths. Case in point: the ever-popular turducken: a deboned chicken stuffed inside a deboned duck stuffed inside a deboned turkey. And while the turducken may not be to everyone’s tastes, the piecaken definitely has wider appeal. Love pumpkin pie, but also want the chocolate cake? There’s now a recipe for that. And it’s surprisingly easy. The piecaken involves baking a pie and then literally dumping it inside cake batter. The Internet is awash with delicious mix-and-match options: apple pie baked inside a spice cake, pecan pie in a chocolate cake, blueberry pie stuffed inside a cheesecake. The list goes on and on. Some even involve several pies stuffed into one giant cake. 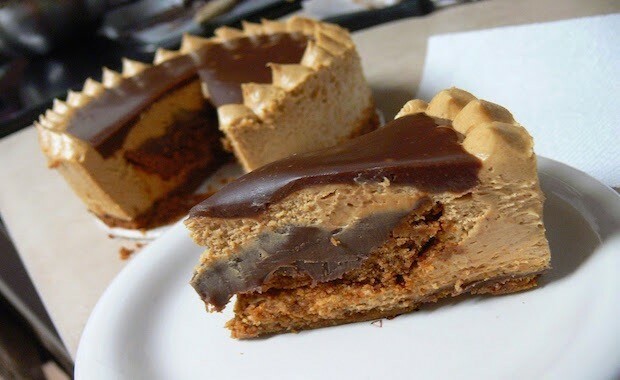 And while the Internet is falling all over itself regarding the piecaken, it actually isn’t a new invention. A quick Twitter search for #Piecaken shows posts dating all the way back to July of 2010. @elizarde for a second I was all “whoa sourdough cobbler” but then I read your tweet properly…; now I have something to make post-piecaken. Even celebrity chefs are getting in on the piecaken bandwagon. Zac Young, from Top Chef Just Desserts and current executive pastry chef at David Burke Kitchen, has been creating piecakens for the holiday season and tweeting all about them. Plus, Kelly Ripa and Michael Strahan tasted one of his delicious creations on LIVE! with Kelly & Michael. No greater joy than someone flipping out over your sweets. TY @KellyRipa for your love of #piecaken, you are why we do this. Sorry, turducken, looks like you’ve met your match.